With thousands of registered wineries in Northern California, it’s no surprise that creating fine home wine cellars is one of our most sought-after services. We’ve been designing wine cellars for years, and for most of that time the design has remained basically the same: a handsome, functional space for storing the homeowner’s prized collection. Lately, however, wine cellars have taken on a new persona, that of a “destination room.” Here, the wine cellar is not only for storage, it is a place where homeowners can take guests for an intimate, authentic wine-tasting experience. 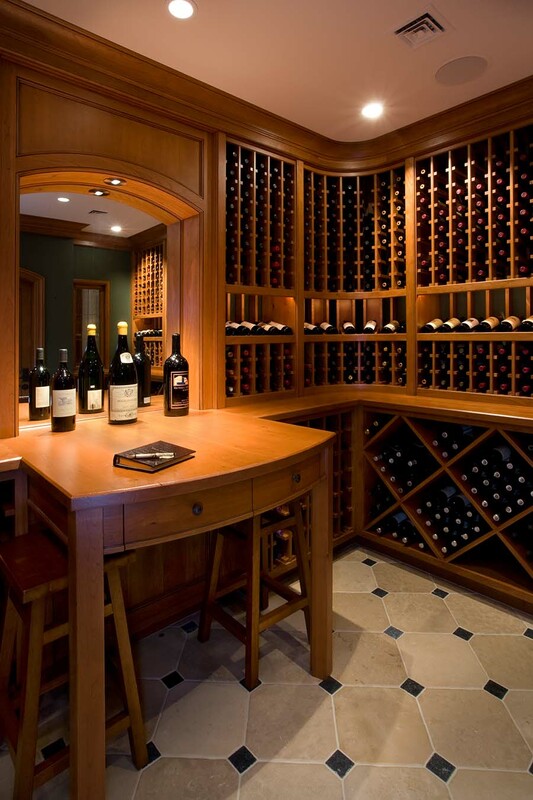 The wine cellar as a destination room doesn’t change the nature of the space. It’s still about the wine and how it’s stored. The difference is in the amenities and the materials used to craft it. While traditional wine cellars relied primarily on redwood for walls, cabinets, racks and paneling, at Midland we use a wide range of attractive wood, including alder, cherry, walnut, teak and maple. We can do so — and give homeowners the opportunity to also select wood for its aesthetic value — because the controls installed in a modern wine cellar automatically regulate variables, such as temperature and humidity, that were once thought to have detrimental affects on wood other than redwood and oak. Wood is also used as flooring for a wine cellar, though most rely on concrete or stone tiles, both of which, by their nature, help to maintain the room’s cooler temperature. As far as lighting is concerned, the first thing we can debunk is the notion that light will raise the temperature of the wine cellar. It won’t: We use low wattage, cooler-burning LED bulbs. Lighting, for the most part, is indirect and atmospheric. Popular lighting scenarios include indirect lighting built into the wine racks, which provides a hint of candlelight, and sensor lights that turn on and off when someone enters or leaves the room. A wine cellar isn’t just about storing wine; it’s also about displaying it and having the bottles readily available for tasting or serving. In many ways, a personal wine cellar resembles a fine wine shop, with three primary storage designs: full display, open casing and bulk storage. In full display, individual bottles of wine rest on a slightly raised surface with labels facing up. This display space is normally located in the midsection of the wine cellar’s cabinetry — the optimal level for what this storage design is all about: viewing the wines and reading the labels. Open casing storage is a vertical column of cubby-holes for individual bottle storage, most often located above the full-display section. Bulk storage is just that: storage for multiple bottles and cases of wine. We also build storage space to accommodate variations in bottle size, magnums and champagne, for instance. 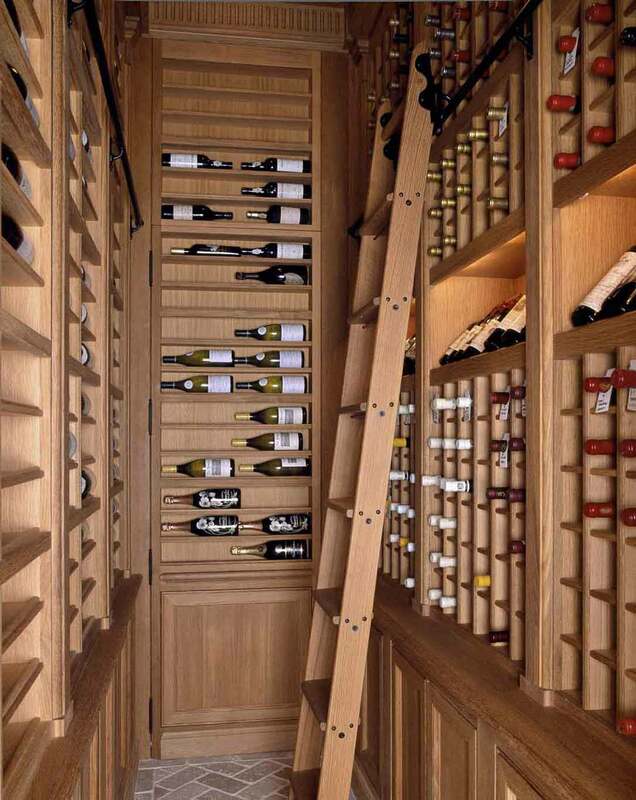 And in more upscale wine cellars — here in terms of the quantity of wine needing to be stored — we can deepen the cabinets to provide increased storage. Atmosphere can be as important as the wine. We’ve created den and cave-like effects, such as adding stone to the walls. Stone gives the room atmosphere but also, by the nature of the rock, helps keep the space cool. We’ve used old wine barrels for ceilings, and we’ve integrated old wine casks into the room itself, cutting them in half to install on the wall, which adds rustic charm. Always on the lookout for elements that can bring extra-special touches to a room, in one instance the spigots we installed on the half-barrel wall hangings were replicas made in our onsite shop — a recreation of the “real thing” found in a Sierra foothills antique store by Midland founder and CEO Rob Boynton. And because a wine cellar is a special place, we believe the entry to it should be of equal importance. Among the entryways we’ve crafted: arched doors with leaded glass and doors stained in old English oak to duplicate the weathered look of vintage cellar doors.